If you live in Chicago or in any of the surrounding Illinois suburbs you know that coldest months of the year are almost here. It’s a good idea to get your fireplace up and running before it gets too cold, and before the busy holiday season arrives. Huddling around a fire all cozy at your home can really bring your family together during the cold winter months. 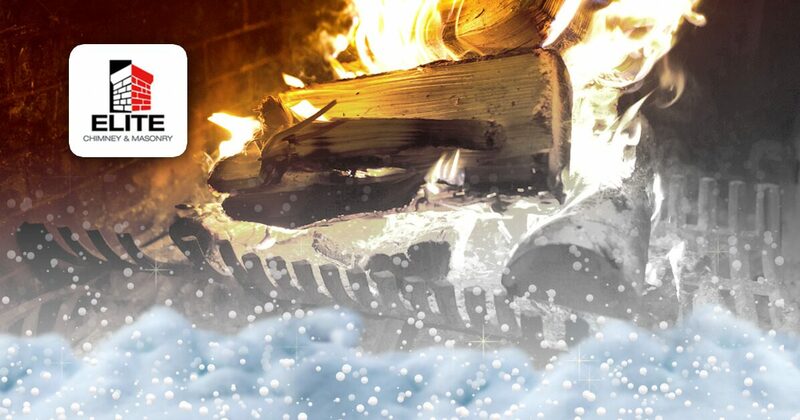 Unfortunately, without regular upkeep and If your fire place & chimney are not properly cared for you can turn those joyous holiday times into a disastrous fire hazard. Be sure to winterize your fireplace with a chimney inspection with Elite Chimney & Masonry before the holidays arrive! Your chimney’s role is letting air & smoke out of your house, hopefully as freely as possible. If there’s anything blocking or trapping air in your chimney, it won’t take long for your home to be filled with smoke. Not good. Anything to do with fire & smoke is NEVER a DIY job and is obviously really very dangerous. If you haven’t had a fireplace or chimney inspection in a while you should handle it before you start using it again. The safest route is to leave any fireplace winterizing needs up to the professionals at Elite Chimney & Repair. Call us at 630-343-5979 or contact us here. We offer annual chimney maintenance packages designed to keep your family safe. This should be a part of every fireplace owner’s annual winterizing prep routine. Remove all of the soot, ash, and burnt up kindling right before winter, every year. Pro tip: If you are worried about getting ash everywhere and making a mess, sprinkle a little water into the firebox before sweeping. The flue operates the opening at the very top of the chimney, while the damper allows you to adjust the size or strength of your fire. You are going to want to test these and confirm that they both open and close properly. Pro tip: Use a mirror & flashlight to see what’s going on up high in your chimney. If there are any issues try cleaning the damper and flue controlling switches. After time these parts can rust or get stuck. Its best to keep an eye on them throughout the year or at least before the Winter season begins. Animals and small woodland creatures can crawl their way inside your chimney’s opening and terrorize your home. Tree limbs and other debris can also fall inside if your chimney is not properly capped and covered. If you live in a heavily wooded area your chances of any of this occurring certainly goes up. Inspect your chimney cap inside and out! Around this time of year, its best to add this one to the annual list as well. It sounds obvious but don’t forget to make sure all of your home’s smoke alarms and carbon monoxide detectors are functioning and working properly. We strongly suggest new or fully charged batteries every year. Make sure you have a fire detector near the fireplace at all times, as well. Don’t take a chance with your fireplace or your family’s safety this winter. Do the right thing, be a responsible homeowner, and make sure you are winterized with an annual fireplace and chimney inspection. It’s only going to get colder and you want to be prepared before the holidays arrive. Pro tip: Make sure your fireplace meets all necessary safety requirements before you start having fires again this Winter. Call us at 630-343-5979 or contact us here to schedule a home chimney inspection with Elite Chimney & Masonry. Throughout the entire Chicago suburbs area we offer free, no-hassle consultations. Have us winterize your fireplace & chimney before the holiday season arrives!